These clients discovered me on this web site. Someone from Florida had tried to draft a set of plans for them, but the planner did not understand how to design a home for a steep property. A builder told my clients they needed a new plan. 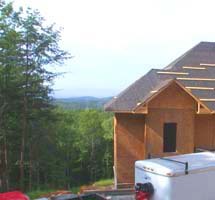 They had a steep mountain property with a fantastic view of the mountains, and they wanted a beautiful summer home that would provide a secluded place for them to enjoy nature. They sent me a drawing of a Florida style home they liked. High ceilings and glass facing the view were very important to them. They especially wanted a tower office on a third level to enjoy the view. But their budget was not large enough to afford everything they wanted. I recommended simplifying the rooflines of the plan they showed me. It was also important to make the home longer and narrower to fit on the steep slope. I designed a new plan that fit nicely on the steep slope. This plan included a third level office, but I tucked it into the same roofline to save a lot of cost. To keep the budget lower, I also recommended putting the second bedroom downstairs. The client decided to be his own contractor. When he ran into difficulties, I was able to go out to the project and solve the problems. 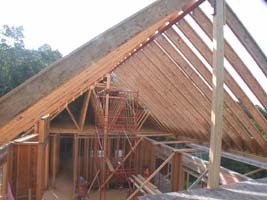 These photos show the roof framing over the cathedral ceiling. 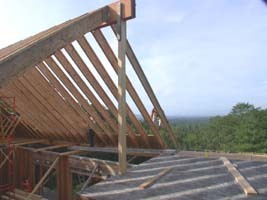 I like using I joists because they are straight, lighter, and provide a full 12" for insulation.